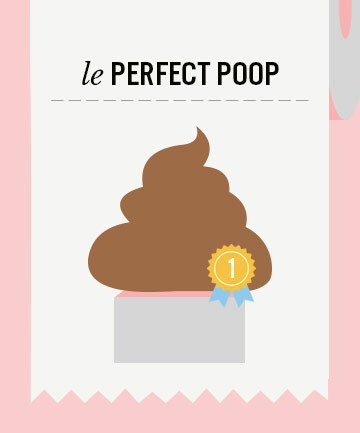 The Perfect Poop What it Looks Like: What's the No. 1 of No. 2s? We may have major #squadgoals, but our poop is at its best when it steps out solo. Yep, according to Sheth, "The ideal stool is soft, cohesive and eliminated in a single piece." (Think of it as an un-dumpable dump, because it is already single.) But what shape does the lone wolf of turds come in? The form doesn't matter as much as the aforementioned characteristics, but Sheth explains this type of stool might take on a coiled or S-shaped look, because it's pliable enough to conform or bend to the shape of the toilet bowl. But, again, if you have a no-frills, log-shaped poop that's soft and eliminated in a single piece, you're still in decent dookie territory. Other attributes of a healthy stool include a light brown color (think peanut butter), and failure to leave a foul odor or much of a residue on toilet paper. Basically, it exhibits the least sh*tty behavior on the spectrum of actual sh*ts. What It Means: "If you have enough fiber in your diet, your stool is going to be more cohesive, so it's not going to break apart in small little pieces," says Sheth. Additionally, Sheth explains that this type of poop indicates your gastrointestinal tract is, in general, working properly and that "things aren't hanging around too long or moving too quickly, but baking for the right amount of time." Kind of gives new meaning to the term bun in the oven, no?